Very nice. 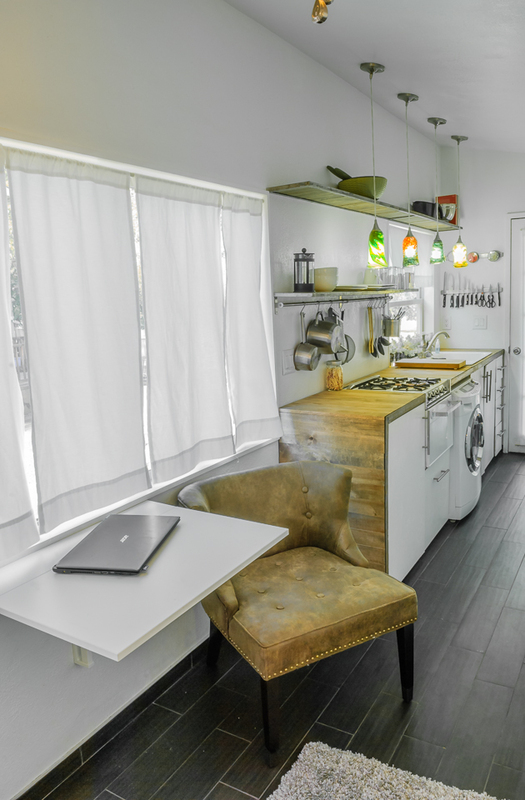 really good use of space, except for your Television. add www to this houzz.com/photos/521108/Hidden-Storage—Swinging-TV-Cabinet-modern-living-room-portland for 1 visual example of what I mean, The bonus would be you could have the TV swing so you could view it from your table chair OR your arm chair, making it a second monitor for your laptop if you need that productivity. Thanks Stephen, I can see your point, the TV is very rarely used and when it is it is mostly as a monitor for my computer, where it is right now for me is the perfect location for that, It is in a movable shelf which does actually have more storage behind it. I toyed with putting it on a swinging arm but in all reality it is nearly never on and I feel like I really wouldn’t use it anyway. If I watched more TV I may make it more flexible like that, it is a great idea! Thanks for the comment! Hi Macy!! I love your home. 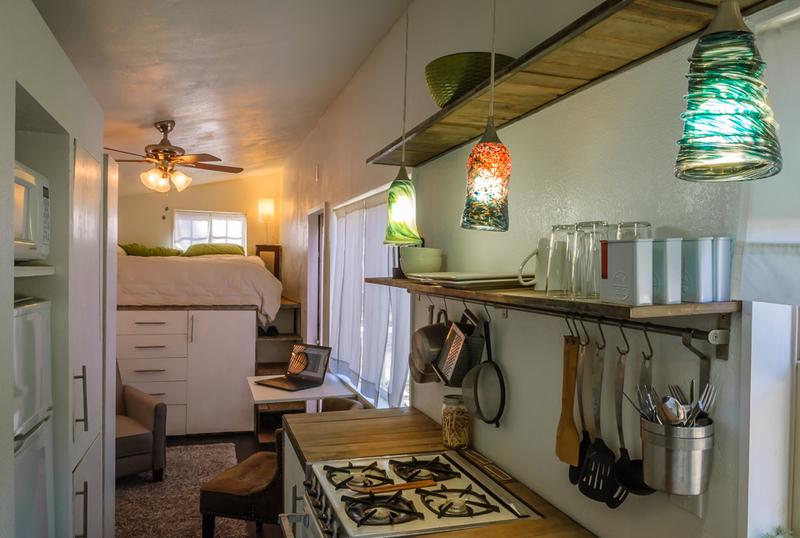 I have come to love tiny homes but I don’t know where to start. Do you have any suggestions? Please and thank you. 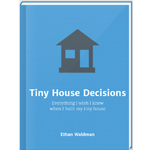 Hi Connie, I have a podcast you can find here on exactly that!, http://www.tinyhousechat.com/episode3-5/ and a posst here, http://minimotives.com/2014/09/15/where-do-i-even-start-with-a-tiny-house/ Hopefully that helps! I think this comment about your TV was downright silly. 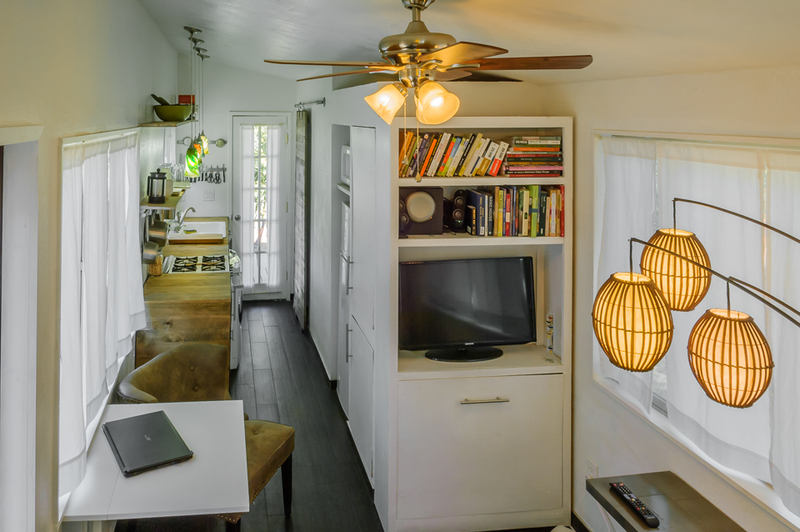 You did a great job of designing a tiny house, and most people have their TVs in site. What the heck! I love your little house. Oh its certainly not the worst I’ve heard 🙂 It’s funny how opinionated others can be about how everyone else lives their lives… 🙂 Thank you for your kindness! 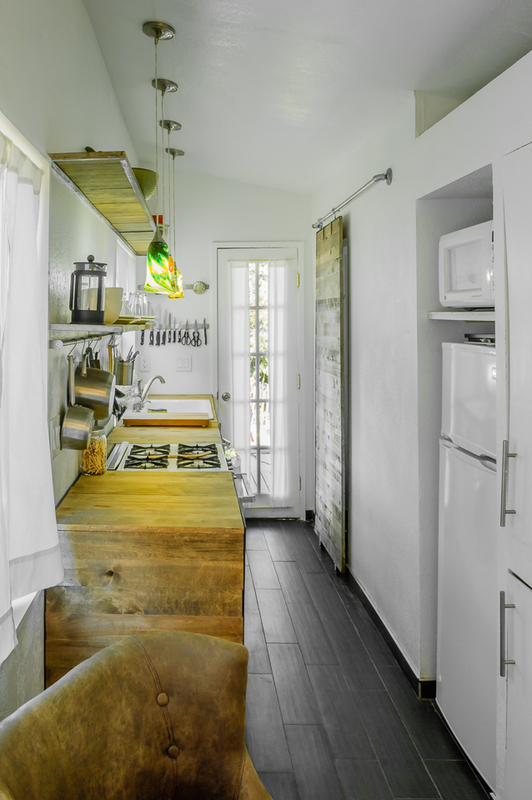 I have looked at hundreds of these tiny homes, yours is one of the best. Wouldn’t change a thing. wonderful! just added a few new books to my “read-list”. thank you for taking the time to respond and i look forward to hear what other gems you have on your shelf 🙂 and, again, you have such a beautiful home! 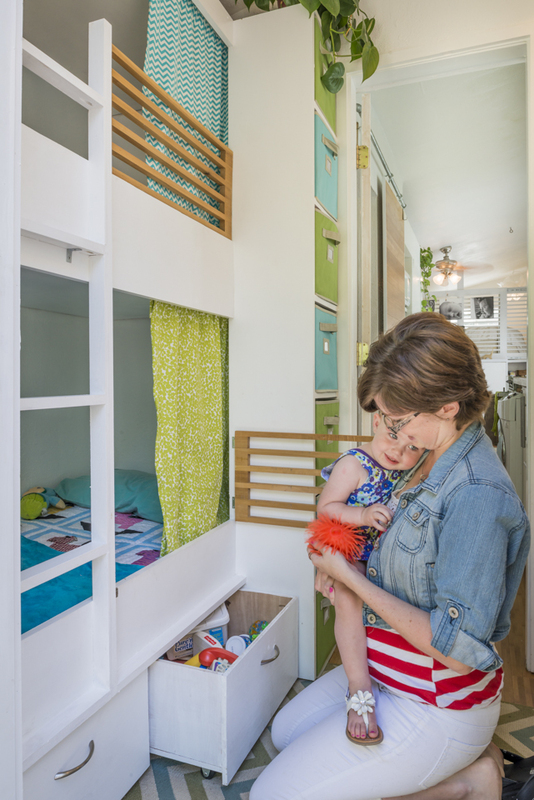 Question… now that your little one is a year older, are you finding the space feeling too small? I am not finding the space feeling too small yet, I think I will be good in that realm at least until she’s 3 or 4, the part that WILL make it feel small is that I am preggers currently so having two will be a juggle for nap times. 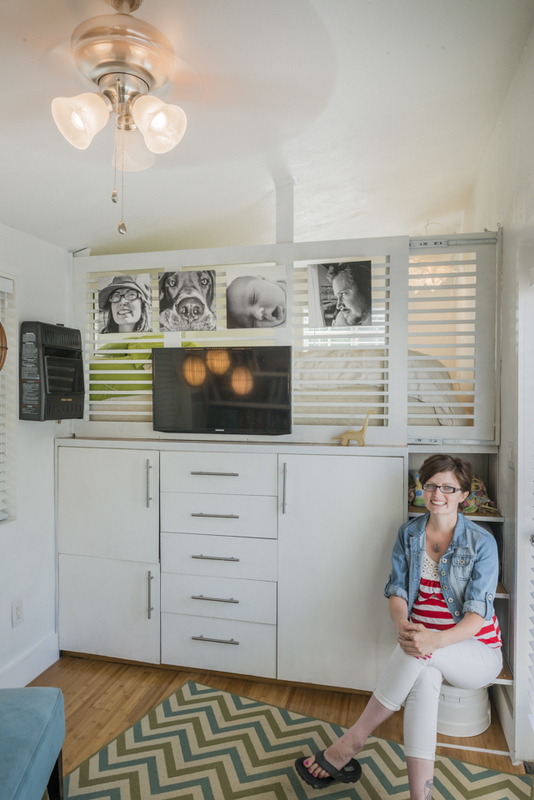 We are going to be building on this summer, http://minimotives.com/2014/12/08/tiny-house-addition/, so that we can have one kid napping while the other is being loud, because that will happen! 🙂 I am happy to say that kids actually don’t take much for some years, the thing they want most is to be right with you so space hasn’t been a concern! It’s been nice to always be in view actually! I was wondering about that- do you cosleep with Hazel? I didn’t notice a separate sleeping space for her. 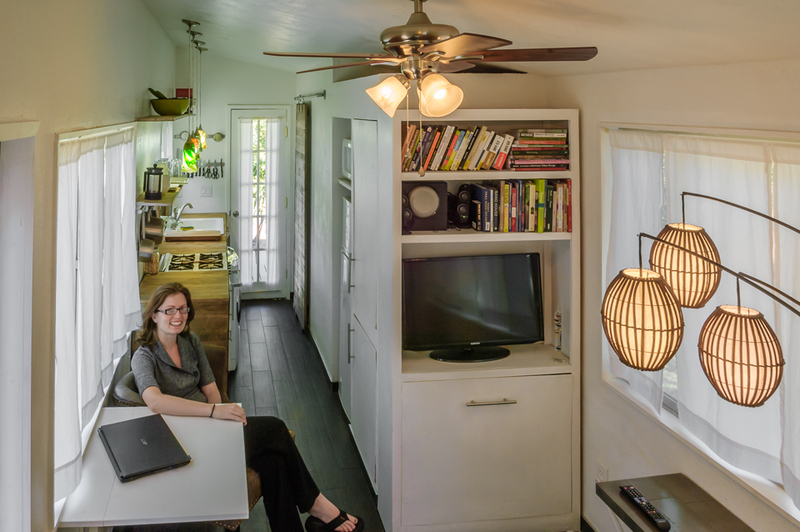 I’m always curious how families make tiny homes work, especially longer term. It is a gorgeous space! 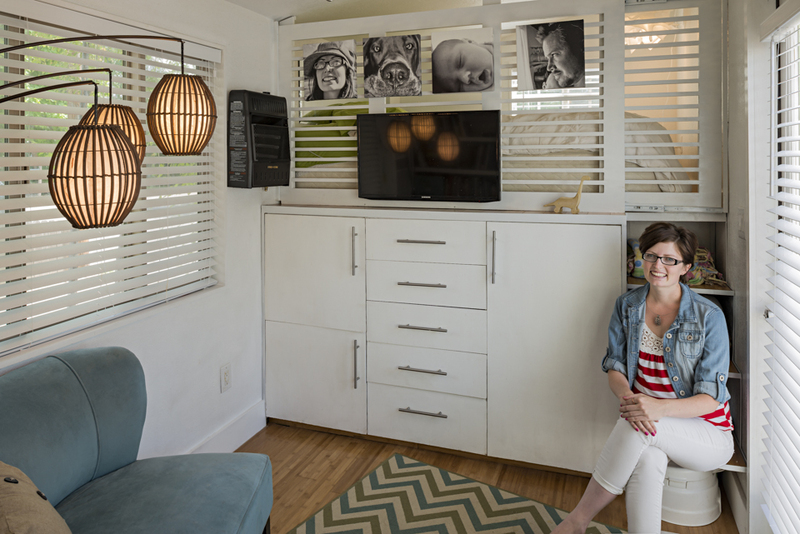 We did do co-sleeping with Hazel, we traded out the king size for a queen size and I built her a co sleeper until we recently got her room added on, you can see more on that here, http://minimotives.com/2014/07/05/can-you-have-a-baby-in-a-tiny-house/, you can see her room here, https://www.youtube.com/watch?v=h-OX1dT2CfE Good question! Beautiful home and well designed! Curious about the build time . . . Can you elaborate on whether the two years was needed to accumulate enough pallet boards or for labor? Also, what was your work schedule like? Weekends? Any assistance/help? The build time was actually 18 months, not two years. The entire first two months were prepping the trailer, if you have a trailer that is ready to go you can x that off the to-do list. There was another two months in there recovering from a broken back where no work was getting done so the work of the house was actually around 14 months which was all ‘free time’. For nearly the entire build I had two jobs, one full time and one 20 hours a week, I also had a three leadership roles in three different volunteer organizations (USGBC, Big Brother Big Sisters and I was the president of my cities leadership program), each of those took up one full evening a week or so… Most weeks I was lucky to get one full weekend day to work, I tried to get a few hours in on the other weekend day and I could usually get one weeknight evening in, I guestimate that I was able to get 16-20ish hours in a week on the build. The hours included tracking down/shopping for supplies, picking them up, prepping all the used materials (the pallets took FOREVER! but were all sourced for free on Craigslist, usually 20+ at a time so it didn’t take too long to gather). I did most of the work myself, my dad helped me with the framing as I needed more hands than I had a lot of the time. The one thing I did hire out was for the reclaimed doors I found to be hung, I think I would try that if I had I to do over because it cost almost 200 to do that and I don’t think they did any better of a job than I could have… I had just heard that it had to be so precise but even after having it professionally done the doors stick, they aren’t ‘quite right’. The plumbing and electrical was self performed but I did have professionals check it before covering it up (my dad is a professional plumber so that helped too). Hopefully that helps. Thanks for the questions! Good luck to you, let me know if I can ever help navigate anything! 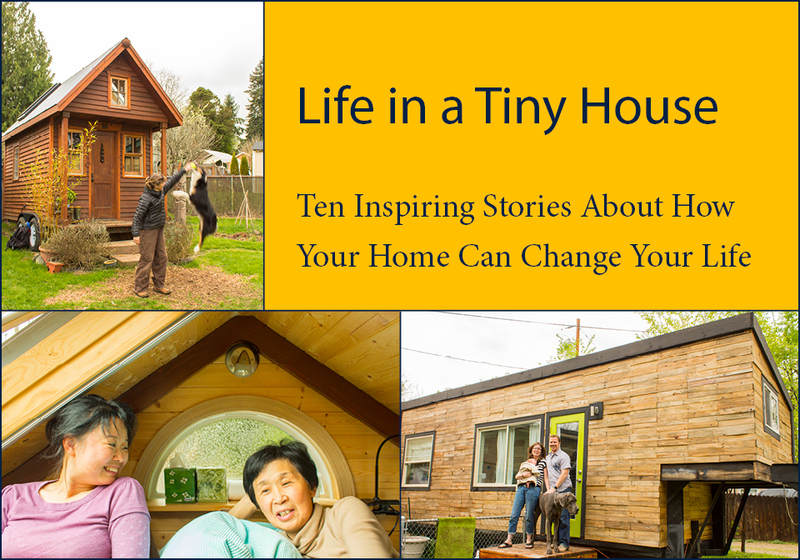 Your tiny house is an inspiration Macy. We espespecially love that beautiful porch. We were also wondering about its location when the pictures were taken. Did you rent space in someone’s back yard? Or, perhaps a friend let’s you use their backyard. Again, thank you for telling us all your marvellous story. 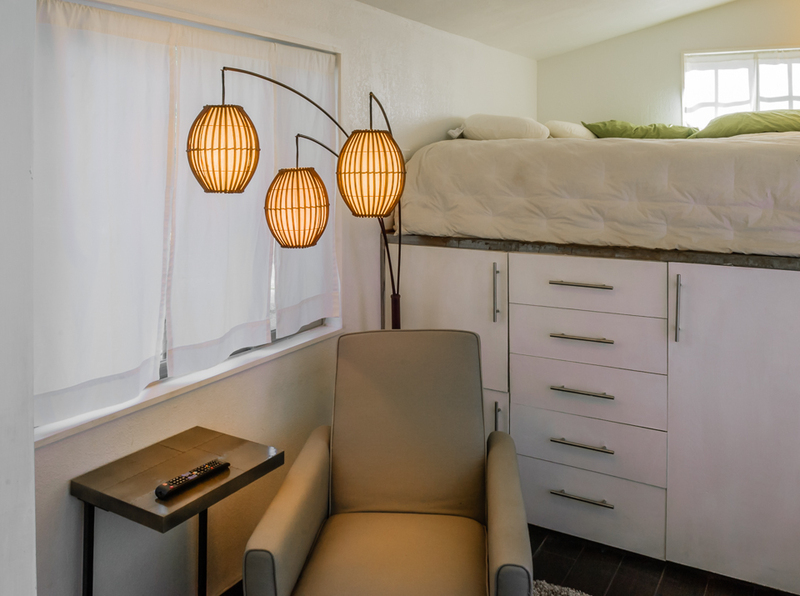 You’ve really got us thinking of building a little retreat like yours. Thanks for the kind words, the photos were taken last October (2013), I rent the property from a friend, it is an empty lot. Thanks again! Happy to help however I can, you can find my email address under the ‘contact me’ tab to the left, it is mizacy at gmail.com. Thanks so much Rosanne, it’s a great read! You may know this already, but they made a movie of The Fountainhead by Ayn Rand. It stars a very young Garry Cooper. Hello Macy, Fantastic idea. 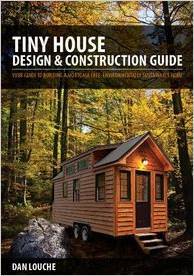 I am curious about where you park your tiny house. Looks like something that I’ll be seriously looking into once my children are grown. Hi Andy, I rent some property from a friend downtown, there is always the option to park in an RV park though it’s usually a little more expensive to do that. 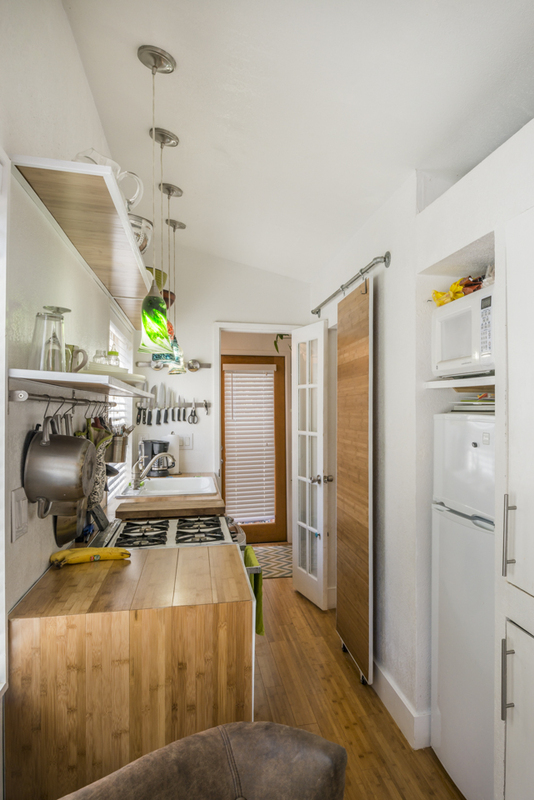 There is also a growing resourcec to hook renters up with property owners at tinyhouseparking.com as well as at tinyhouselistings.com. Hopefully that is helpful! I couldn’t figure out how to comment on your other post but I wanted to congratulate you both on your little baby girl, she’s precious!!! Loved all the photos you posted 🙂 Hope you have safe travels to the NC conference!!! I’m not sure if this is a question or a part of one but yeah. 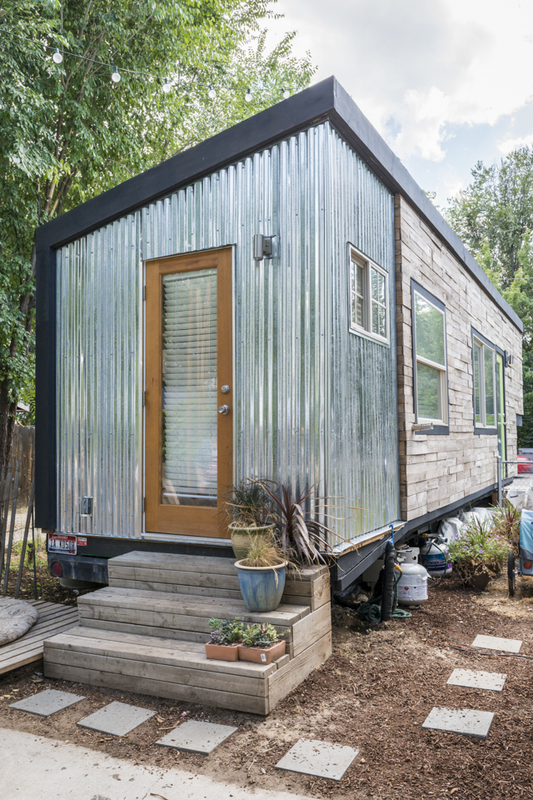 Where do you park your tiny house? Do u have to buy a lot? 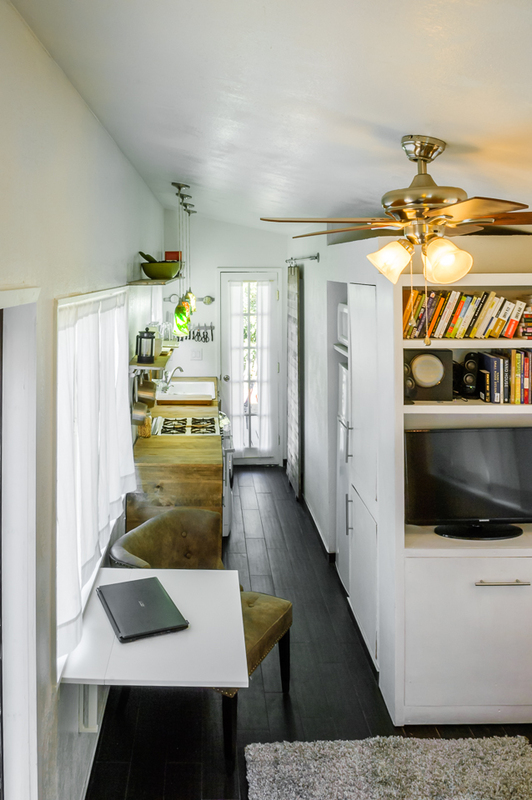 Hi Susan I rent the lot per month, there are some great sites for connecting land owners with tiny housers, tinyhouseparking.com and tiny house hosting on facebook for instance! RV parks are another option. What is the approximate rent per mo. for a lot? Also, you might consider being a host at a campgrounds. Some of the parks are beautiful! That is if you are mobile. I realize you would have to leave your porch. It varies just as much as real estate, there are tinies in San Francisco paying $800 a month, there are others trading lot rent for mowing a lawn… I pay 200 month. Pingback: Green Building Elements | From brick and mortar shops to city planning, we cover sustainable trends in construction, renovation, and more. What are you going to do once your daughter grows up and needs her own bed? Just curious. 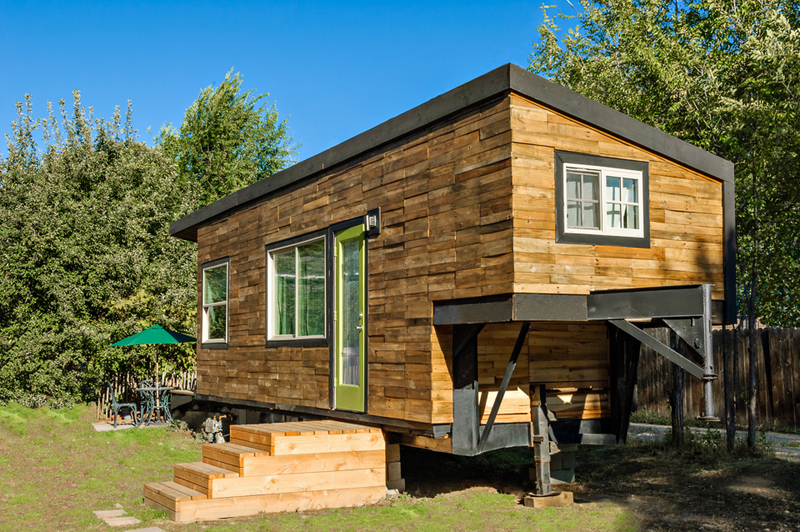 I love the tiny house movement. I am not sure I could go quite that small but I am definitely in the frame of mind to downsize a lot. She has her own bed, it is a toddler size mattress/co-sleeper. Eventually we will upgrade though to another ‘alternative’ house with her own bedroom, paid for with the cash saved. Pingback: Creative and Arts | Art, Photography, Humor, Facts, Humanities, and Travel. 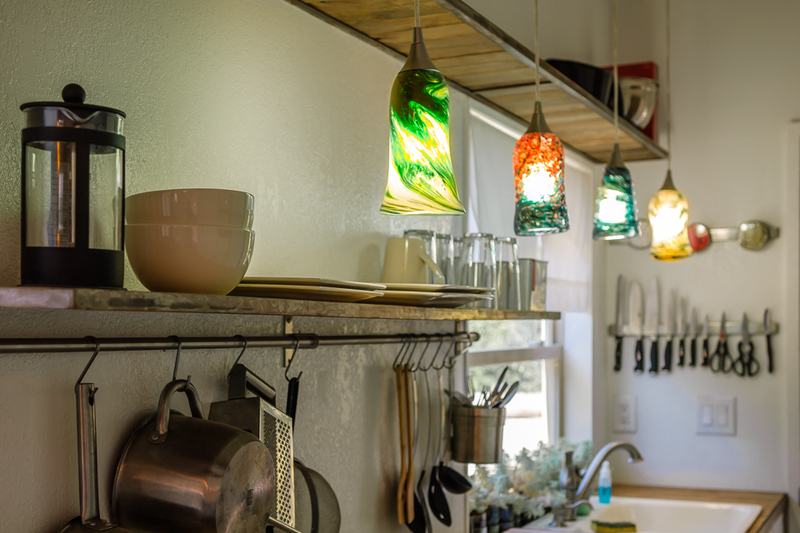 What a beautiful house and so very economical and recycled! I run a used bookstore in Parry Sound, Ontario, Canada and am always trying to find ways to make the best use of a small space – however, we are no longer as small as we once were due to a recent expansion. I came across your wonderfully designed website via Country Living, a magazine that came into the store from one of my customers. I then checked out their website and a picture of your place was featured prominently on the main page. I have just spent some time this summer visiting my parents who have a TV (I have 120,000 books in the store so don’t bother to pay for TV access) and my mom was often watching a British TV show called Small Spaces or something similar. It was all about building homes in similar sized spaces such as yours. Being single and on a limited budget (used bookstores don’t pay big salaries), I have become very intrigued with the idea of a similar home for myself. One of the problems up here in the “great white north” is the long cold winter and the less space to heat, the better! And, having traveled, lived and taught ESL abroad for a number of years, I am used to staying in a small space. Your website and photos were a joy to come across and I wish you all the best in the future. Thanks for the inspiration! What a nice note Melissa, thank you so much! I’m so glad you like it! Hi, I don’t collect rain water persay but I try to use it on the way down. My roof and back wall drain to some planters where I will have some vines planted to grow up the trellis on said side and roof. Any overflow just goes on the ground, I would like to eventually play around with hydroponics and collect rain water but not at this point. 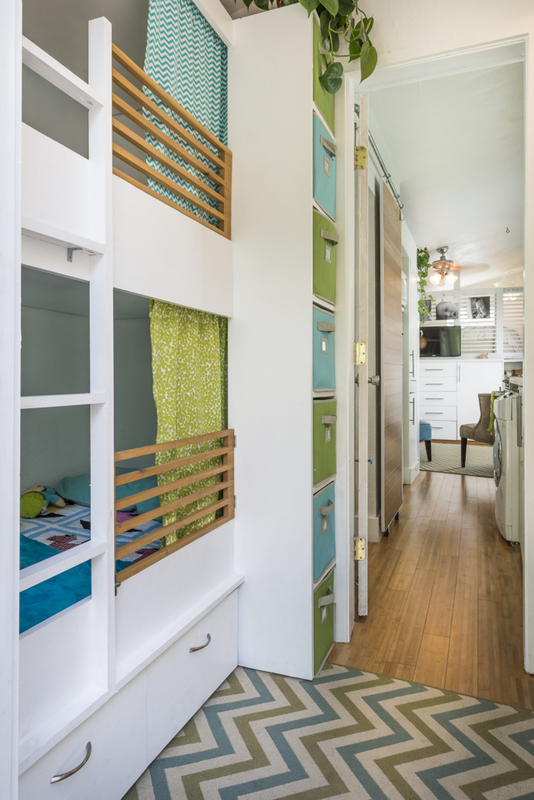 I just want to say how much I love the idea of moving into something smaller. There were 12 in our family with 1 bedroom and 3 in the attic. I never thought we were cramped. Got married bought a home 1000 sq ft and my father said what will you do with all this space? We had 6 children in 10 years. Moved out of that city to one where the houses were bigger and better schools. So here I am alone in 2000 sq feet. Less is better, you can never keep up with the Joneses. No bills, no mortgage that is how we lived. I really love the idea that people are getting back to how things used to be. I agree entirely! It is a step in the right direction! Beautiful house. 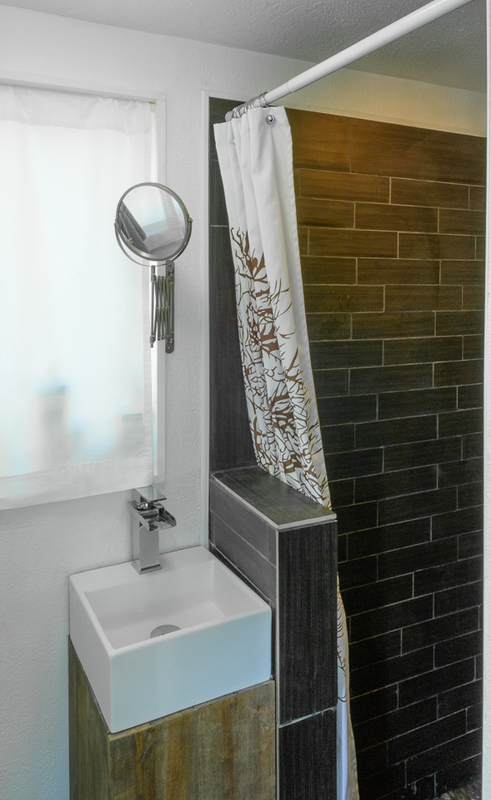 You did a wonderful job utilizing the space well and making it look great at the same time. I imagine Denver must take up the most space! lol! He’s absolutely gorgeous btw. I was wondering about your electricity and water. 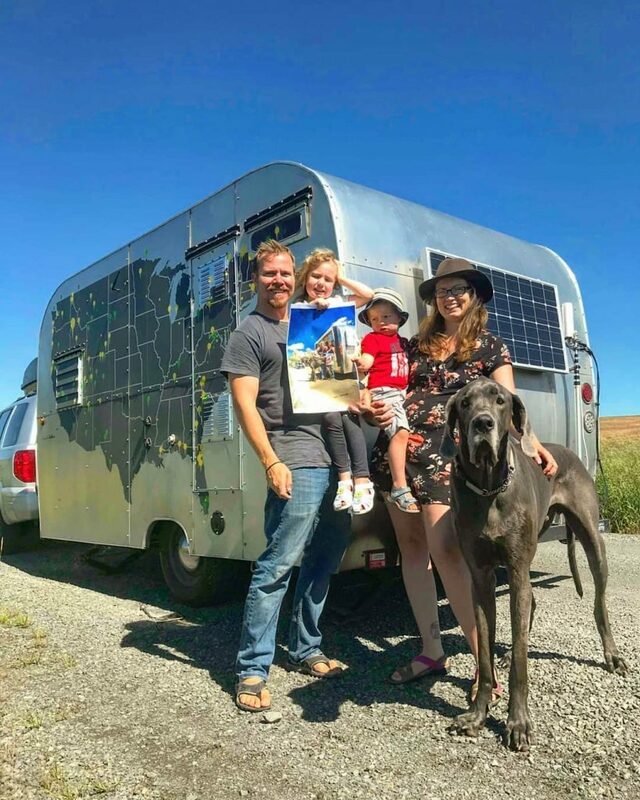 Do you use solar or are you plugged into the city (since it appears your’e in a city/town and not in the middle of nowhere like many tiny houses)? 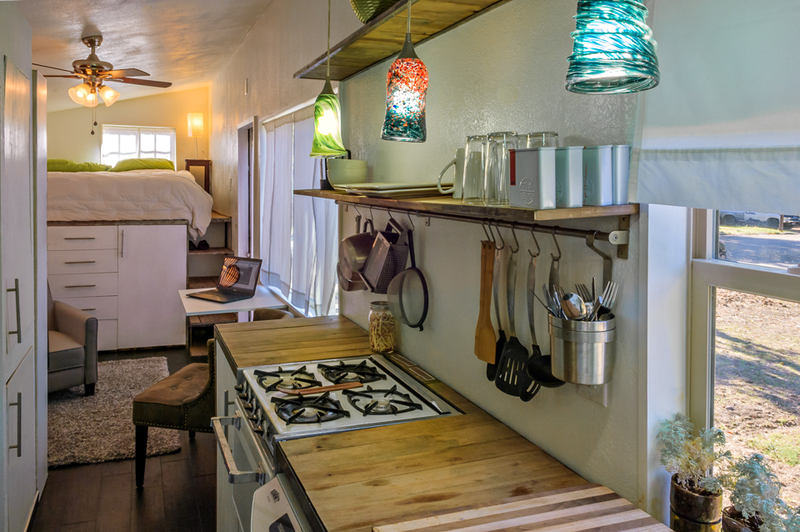 The more I look at tiny houses the more I would like to live in one. My daughter has 2 years left of high school then I’m free to go where the wind blows me. Hi Shannon, Denver just commandeers the couch mostly :). 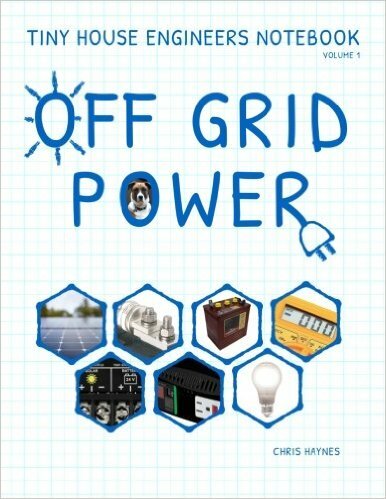 I don’t use solar just because our power is so cheap here, when I move away from the city I have it designed so I can be off grid so eventually that will change. I am connected to water via a potable water hose on the property so its all city services except septic, I am off grid as far as waste is concerned. Best of luck being swept away soon!! I really love your home and plan on purchasing your plans. I think you have the best lay out of any home I’ve seen. One question though. …would your plans work on a tumbleweed 24 foot trailer? 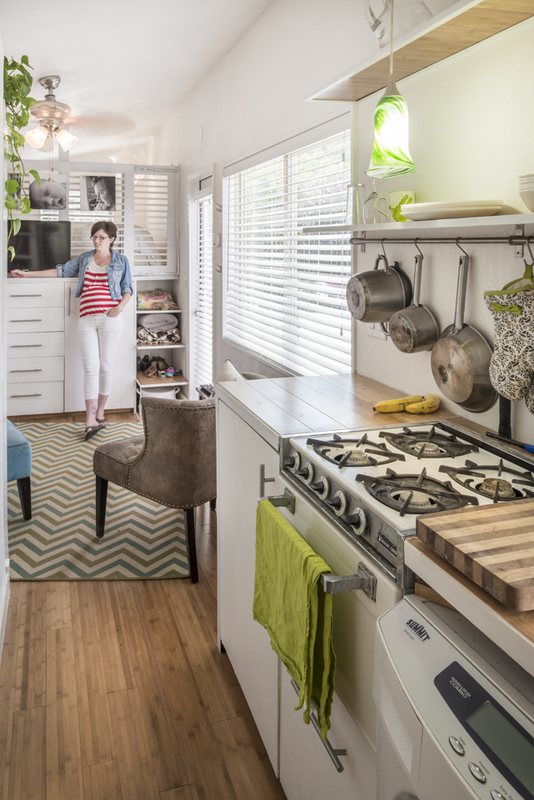 Your home just looks so much more spacious. Thanks Kathy oh p.s. can’t wait to see Halloween costumes and decorating! Hi Kathy! Thanks for the kind words! I’m not sure of the specifics of a tumbleweed trailer but if it was 24’x8′-6″ you could do a similar house. The bd area would have to alter slightly since mine is built over the gooseneck. I did a version of what that may look like since I got nough questions wondering if it could be done on a more standard trailer, you can see it here, http://minimotives.com/2014/05/21/bumper-pull-style-minimotives/. I have read that recycling pallet wood can be dangerous due to chemicals and or bio hazards. How did you insure clean wood from pallets? It can be, there is not a great way to insure that in my opinion, whether its from how the wood is treated for use as a pallet or whatever it carried potentially spilling on it. I wasn’t comfortable using it indoors for that reason and so I opted to only use it on the exterior. Love the house. Curious though, where can I put one of the and have water and sewer hooked up? Do you have water and sewer hooked up, do you own your land? Anyway, very nice and inspiring. 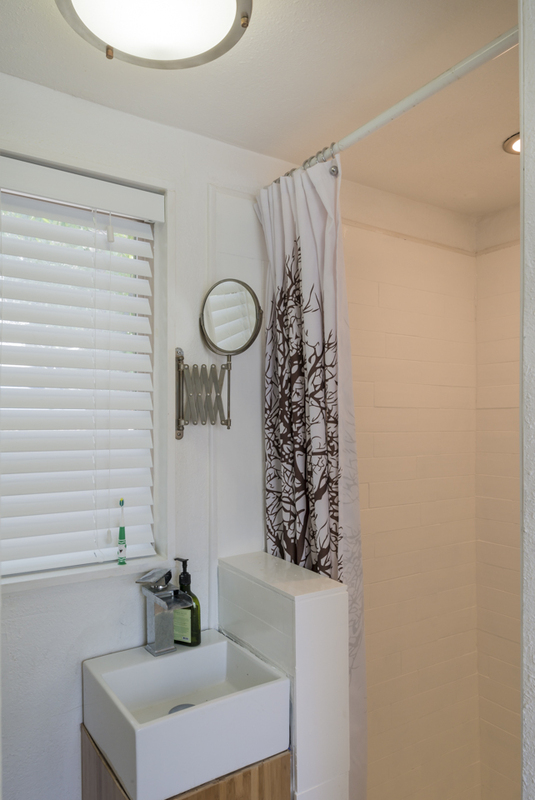 Here is some info on where you can park a tiny house, http://minimotives.com/2014/06/25/where-can-you-park-a-tiny-house/, I do have a potable water hookup on site but no sewer since I am completely off grid in that respect with my composting toilet. Grey water is collected and used in my garden. Nice. Thanks for responding so quick. Sorry my phone is crappy for this. Lol I can’t tell if you got my next reply. 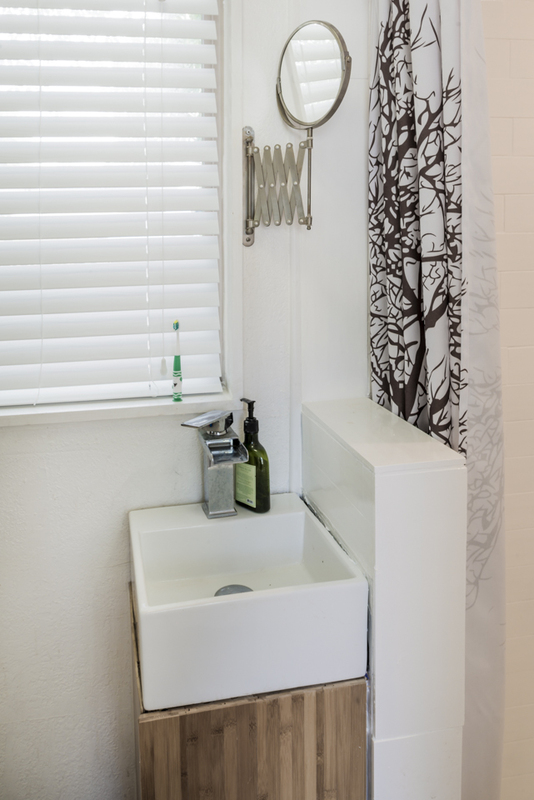 So you use composting toilet and collect grey water as in shower sink and washer to use on garden. Is that safe to use on garden with soaps used for dishes cloths and shower? I’m excited I’d like to do this in Missouri. Where could I find out about laws in Missouri? Do you park in someone’s backyard? Also, what do you do with the compost from the toilet? I cycle it into my normal compost bin after letting it all process via the manufacturers instructions and then use it on my flowers. Forgive me if someone has already asked. 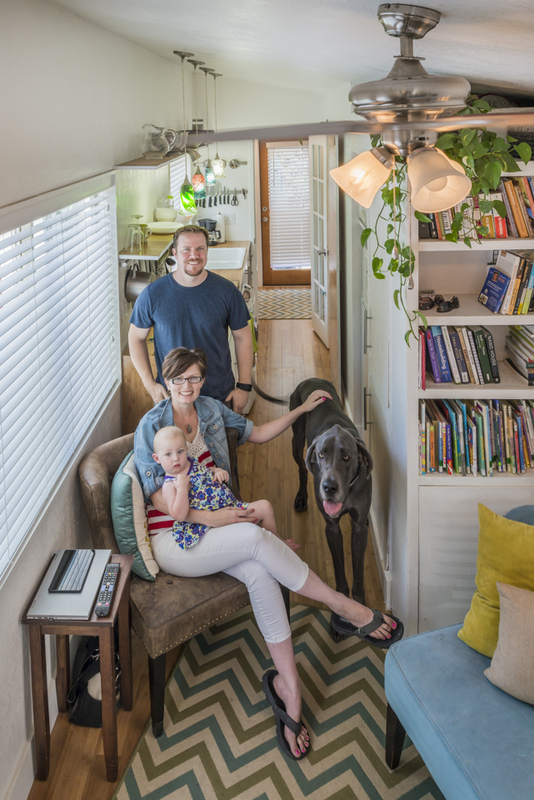 What kind of truck or SUV does it take to move your home? This is the coolest. I work for the railroad and can transfer pretty easily from one terminal to the next. But am so tired of renting and somehow never really feeling at home as packing light has become essential. So very inspired by what you’ve designed, built, and overcome! 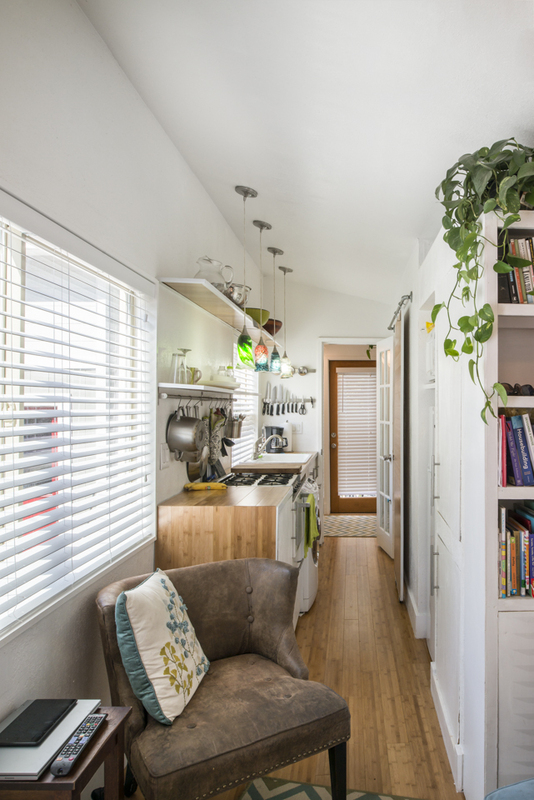 My last question is if you’ve thought or if you already sell loose plans for your tiny dwelling? Thank you for the kind words! I just hired a tow truck to move my house, it was much more cost effective for me, it was moved with a 1 ton dually truck though with no issues! I do already sell plans for others if wanted here, http://minimotives.com/buy-plans/. Hope that helps! Thank you for commenting so quick. So you use a compost toilet and collect grey water as in water from shower sink and washer to put in garden. Is that legal in Missouri? Also what about soaps used for shower or clothes or dishwashing? Is that safe to out on a garden? Im not sure if its legal in Missouri, it varies state to state (I’m in Idaho). I use soaps from soapforgoodnesssake.com which are all natural and safe, if I didn’t I would be more leary to use the water on my crops! Macy, what type of flatbed trailer did you use? Hi Brittani, I used a home made farm trailer, its a 24′ flatbed gooseneck with a 5′ dovetail. Hope that helps! 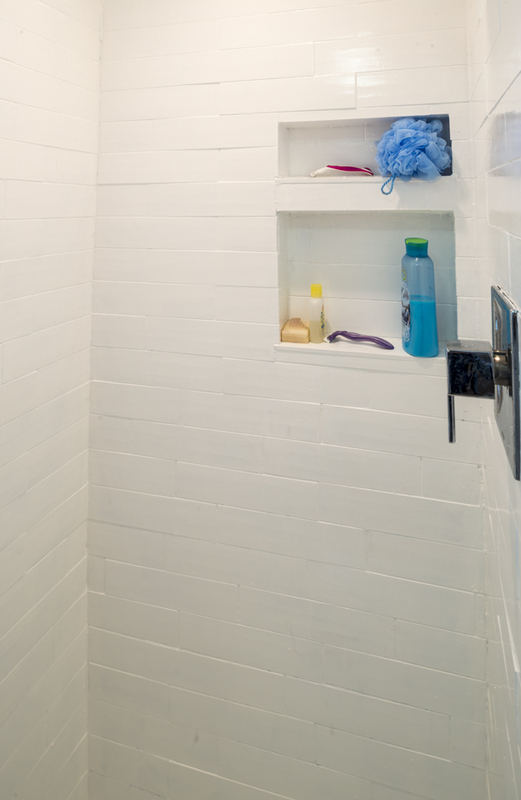 I can’t visualize the bathroom setup.. Can u send a picture with the shower? I want too see it on a floor plan..
Hi Macy!! My name is Abby and I found your house on the web and let me tell you that you and your family have an awesome house… I live in a different country and your house has given an great idea on what I am looking to live, actually is cheaper and different and an alternative for small family and those don’t need too much to live with, as we sometimes accumulate things that we don’t use and actually this type of house you have will make people to have what they really need…. Thank you for sharing your sweet home!! Thank you for your very kind words! I would love to have plans to this house! I really want to build a tiny home and I think this would be perfect for me! I love your work. 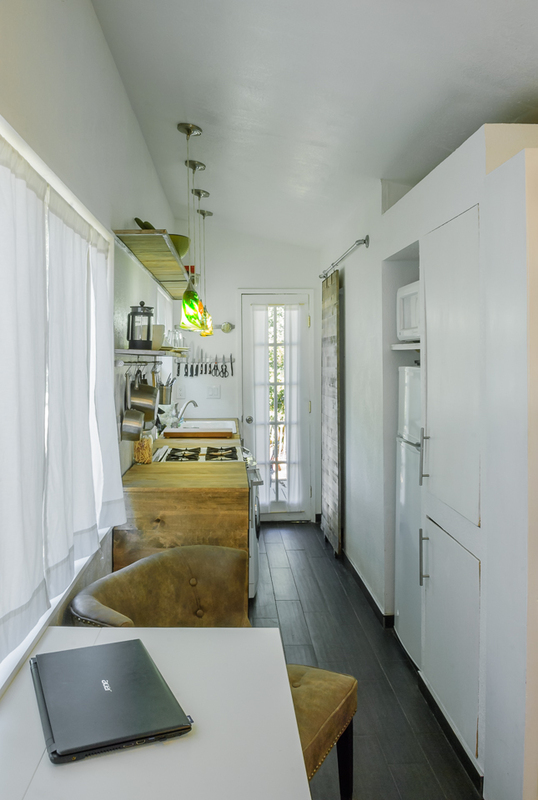 the house really reflects simplicity, cosiness and warmness. 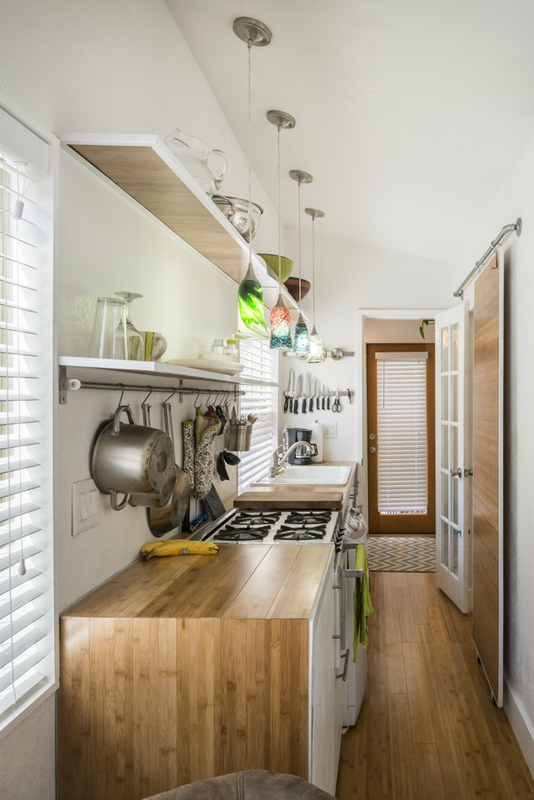 I would like to know I one can commission you to design plans for an other tinny house. I don’t do custom work because it is hard to make it work financially, even tiny designs take a lot of time! I try to take the approach of helping others learn what they need to know to design their own tiny, I have 4 eCourses that you can find here, http://minimotives.com/courses/ to help with that. Love your home and plan to build one for myself. I have a couple of questions…. How on earth did you get that trailer for $500? I expected it to be around $5000. Why did your toilet cost $2000? That seems extremely steep. 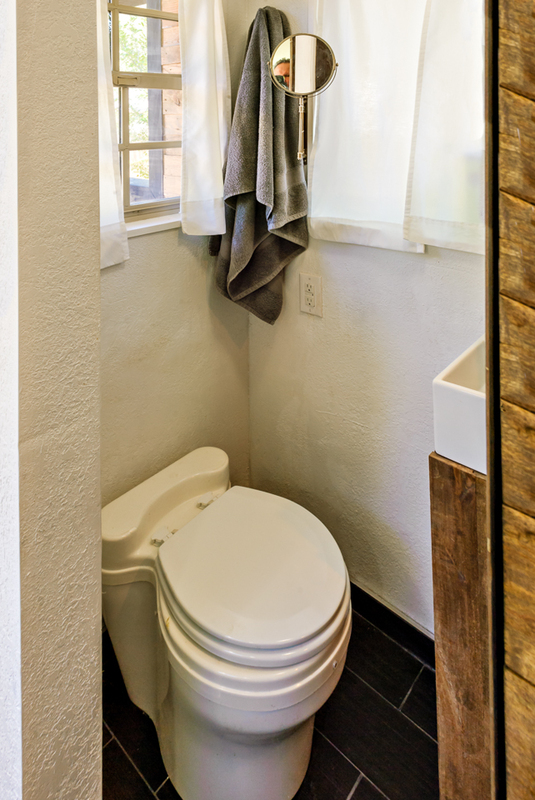 So far all the composting toilets I’ve seen in tiny houses have been nothing more than a bucket placed inside a home compartment with a toilet seat on it. My trailer needed A LOT of work and was on craigslist, it took a solid two months of me working to get it ready to build on 🙂 3-5k is reasonable for a ready to build on trailer :). The toilet cost that much because it has passed government testing and been accepted as a legal alternative to sewage handling, not everywhere but in lots of places. It is the testing that drives the price up… I wanted to be as legal as possible. I live in a city center and humanuer toilets are definitely not allowed, most of those are in rural areas. 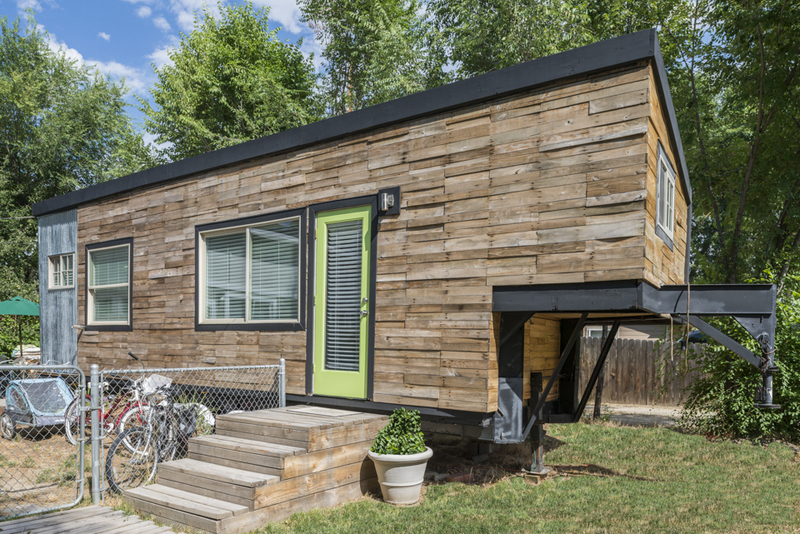 Hi, nice tiny house, but where have you been able to park it in the Boise area? 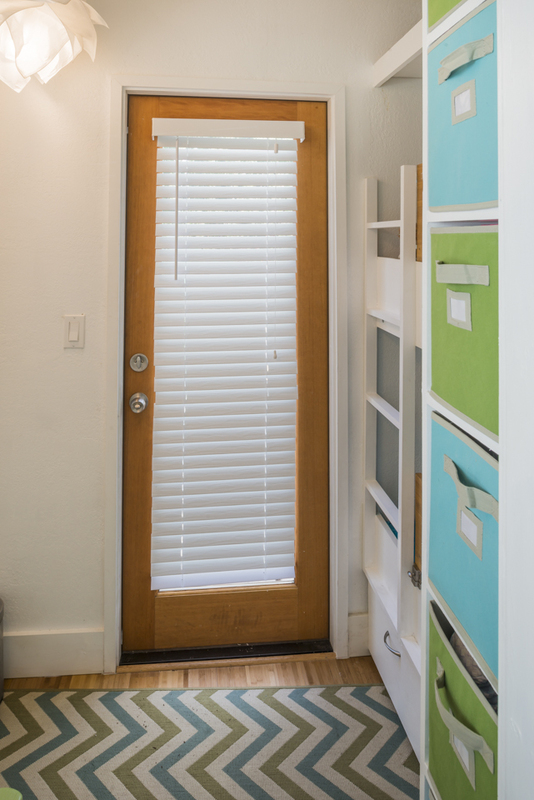 I live in the area too, and I would like to buy something similar, but I don’t know where they are allowed. Thanks. This is a tricky topic, I am not LEGALLY alowed anywhere but an RV park but I park downtown on rented property. I rent because I don’t want to invest in a piece of land only to be told to move and have no recourse. That is just kind of how it is right now BUT there is a group of people looking to change that and we have a couple exciting projects happening around the valley. 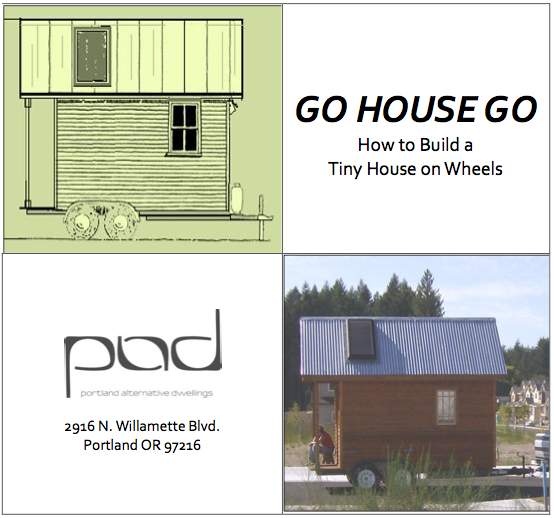 Two links, first, http://www.planningtiny.com/events/ I am giving a talk on tiny house codes in about two weeks, I will invite you to come, the main goal is to get this conversation started locally, I expect there will be leaders from a couple cool projects coming up as well as city officials who have been keeping their eye on the tiny house movement, hopefully some good conversations will come out if it and things can continue happening in a positive way! 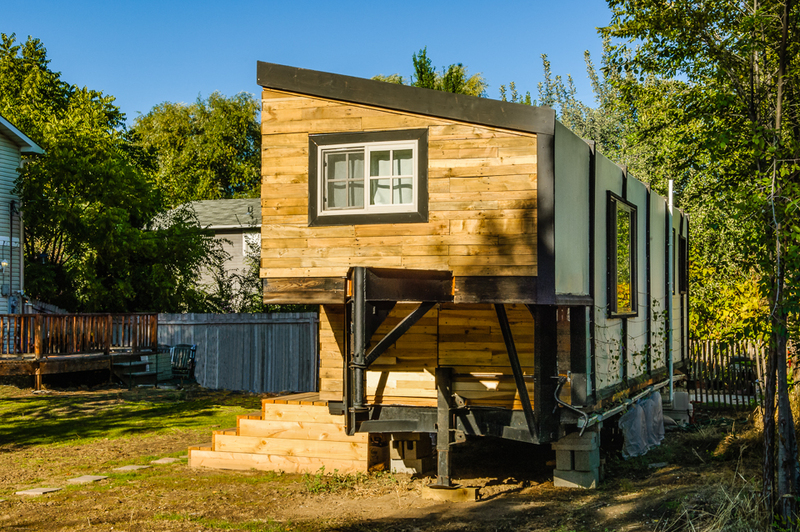 Second, http://www.meetup.com/Idaho-Tiny-House-Enthusiasts/, we have a local meetup group where there are land owners and tiny house folks collaborating and talking about possibilities around tiny houses, I do a couple open houses a year and there are others around who put on events, if you’re interested we’d love you to join in! 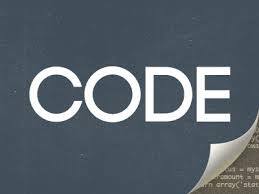 I know its vague but hopefully that helps a little, I will go into more depth at the codes presentation! hi marcy i am mete from Turkey my english is bad,i am soryy for this. i have youtube channel about tiny house and if you excuse me i want to about your home and your website on my channel. I think I understand, I can’t release the images for your use though as they are copyrighted by the photographer. Thank you for being considerate and asking. Good luck! I love your tiny home no stairs to climb and a place for everything in its place yet room enough to move around with a cane. Fantastic Job, I am really motivated to begin my project. I was curious about a few things. I loved your pallet idea as I have about 200 of them in my business just taking up space but am not 100% sure how you did the siding? Did you use the top slats of the pallets and then plane them down? Or did you use the 3 vertical pieces of the pallet (often oak).?? You stated that the first 2 months was trailer prep, what kinds of things did you have to do to the trailer?? 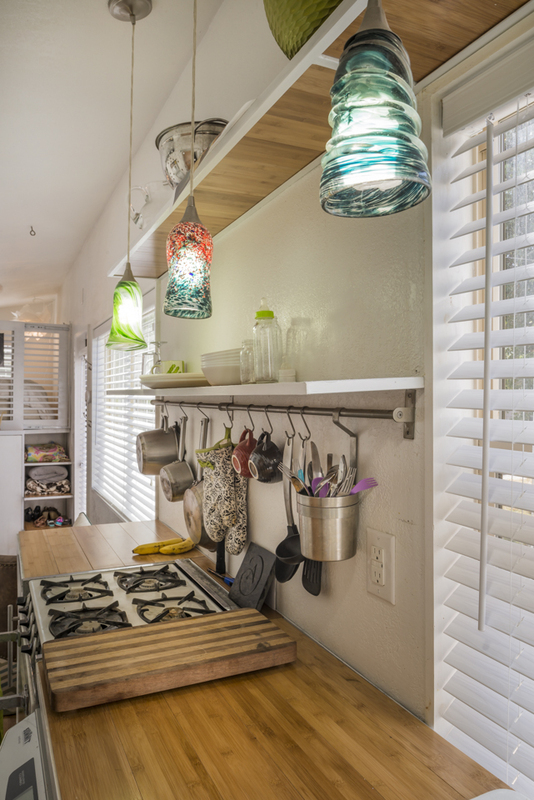 One main question I have with the trailer mini-homes is the plumbing. Does it come out the bottom of the trailer (as I think the floor is right on the deck of the trailer and the drain for the shower would have to go under??? ) During winter what is to prevent the pipes from freezing? 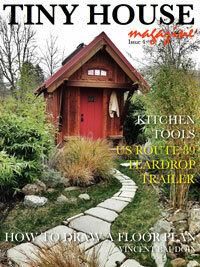 Thanks so much… one last thing.. is that a composting toilet?? I had a friend with one and it was so foul smelling. Insights?? Thank you for the kind words!! 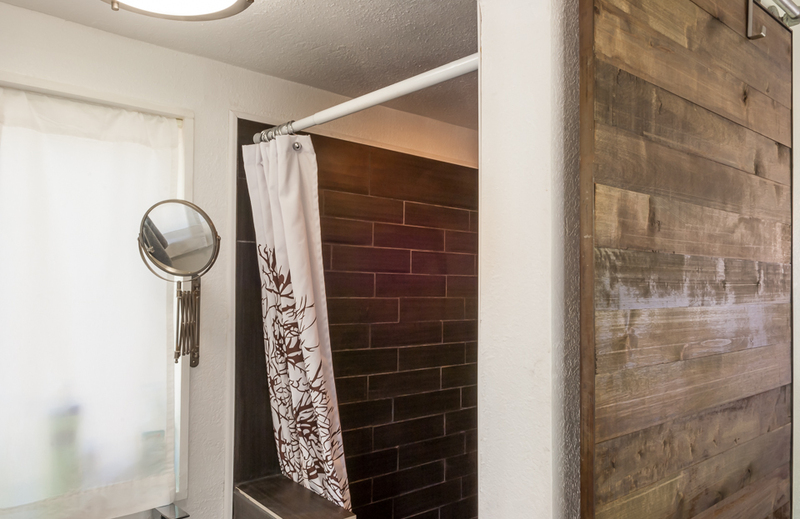 I used the top slats of 83 pallets, they are all different wood because they came from all over, it made it really beautiful before I stained it to be boring! 😉 I then had to rip them all to a uniform width (well at least each row) then planed them down to get the gunk off and then assemble them in a rain screen assembly (allows an air gap behind the siding, the siding is not actually the moisture barrier, its further back). I did not end up using the three vertical pieces at all. I bought a dual axle trailer, I had to add a third and re-position the existing two axles. I had to weld on a platform to the goosenec portion, remove and replace some shotty struts and clean the rust and reprime/paint the entire thing. People approach the plumbing differently, largely based on climate, I live where we have four seasons, I can’t have exposed plumbing. My lines run inside my floor and walls so they are in an insulated space. 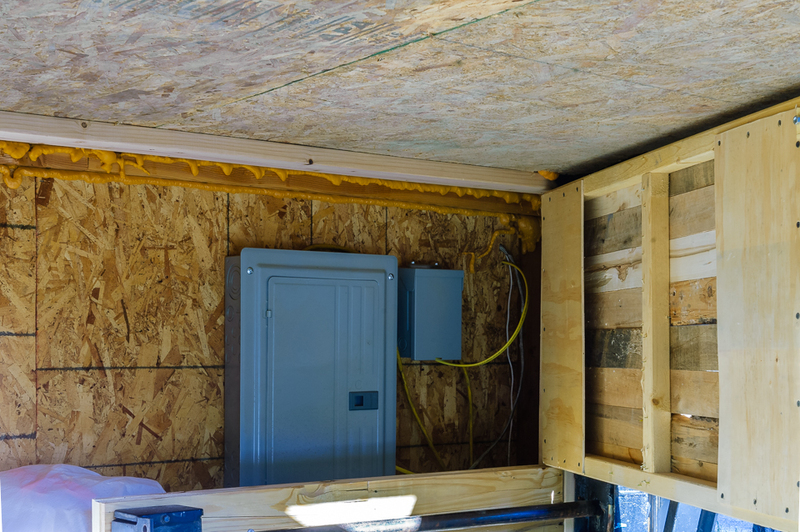 Some folks build their floor on the deck and some build into the trailer frame, I did the latter to save height and have the insulated space to use. 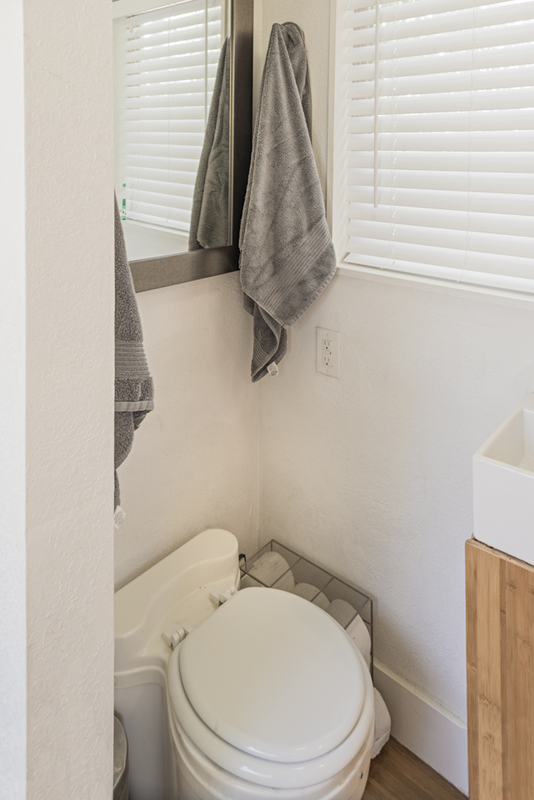 It is a compost toilet, a properly functioning compost toilet does not smell, it is often confused with an RV style toilet where solids and liquids mix, that creates a very foul smell, no one wants to live with that, There are a TON of options for different kinds of compost toilets. If you are interested I have put together four eCourses that go much deeper into specifics on all of these issues, guessing by your questions the Utilities and Systems course might offer a lot of incites deeper into issues like plumbing and potties :). They can be found here, http://www.planningtiny.com/courses/, one covers codes/trailers, one on construction, one on custom design and of course utilities/systems. Hopefully they can be of use/interest! Hi! I have read every post. I absolutely love, love your home! We have a teenager, who would require a private bedroom, just as my husband and I would want private room. Suggestions? And, there are companies who manufacture and sell the insulated shells and then the buyer finishes the outside and inside. Cost seems to vary from about $8,000 and up depending on size, of course. I have seen a 12 x 12 for about $8,000. What are your thoughts? Oh, and we also have a big dog. So, two adults (well, actually three with a teenager) and a big dog. You said you are adding on to accommodate your growing family (congratulations BTW!). What size would you recommend for our family? We REALLY want to do this and kiss mortgage payments, property taxes and insurance goodbye! You are wonderful in sharing everything! Thank you. Love (did I say “love?”) your home!!!!!!!!! Fantastic!! 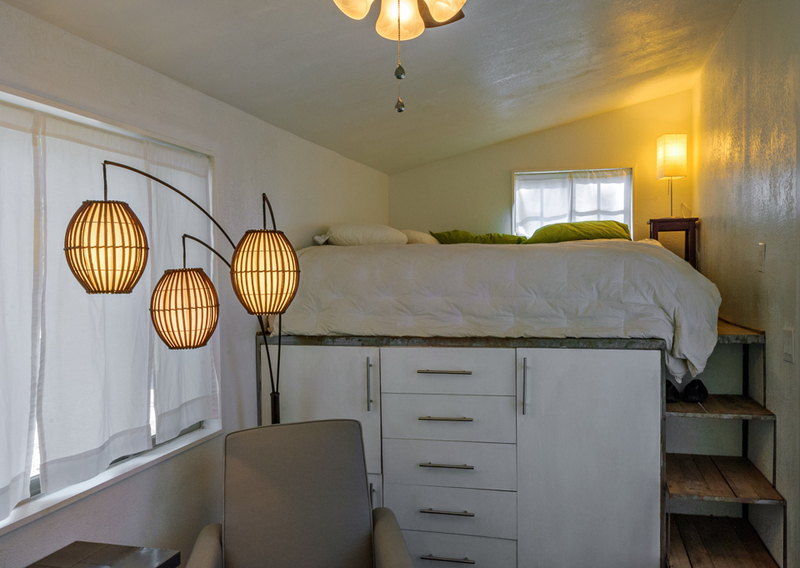 You could easily wall off the ‘loft’ where I have my bed currently and the addition I just built is a second private room if needed, it will currently fit a twin size bed but you could easily alter the bathroom/kitchen to get a couple more feet in there if needed. Anytime I get contacted by a company wondering what the market wants I always say shells, people thing the shell is the daunting part but feel much more comfortable finishing out a space. I’d suggest just finding a builder and asking if they are up for doing just a shell, most will say yes. I believe the ones who are RVIA certified will be less likely to be able to help since they have to meet certain requirements to sell their units, part of that would include finishing them. I think most shells I have seen come completely dried in and finished on the outside, you just have to finish the inside, I think insulation is normally not included since electrical mostly goes in before insulation. A 12×12 shell for 8k sounds about right, if it’s on a trailer you can probably expect a little higher, just because of the cost of the trailer. 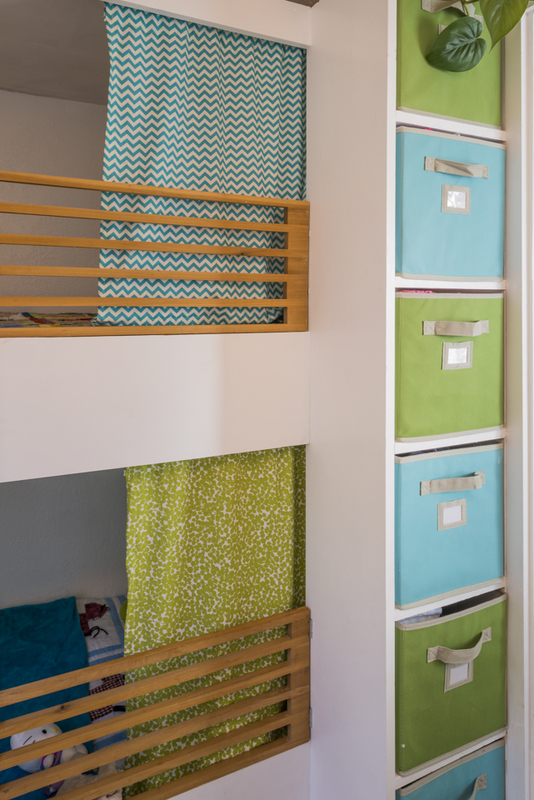 As for what I would suggest for your family size… I think it depends on how you each live and what sorts of things you need to accomodate, if your kiddo likes the drums you’ll be adding some space for a drum set ;-). I think the size of my house with the addition (232 s.f.) could work very well for your family dynamics generally. 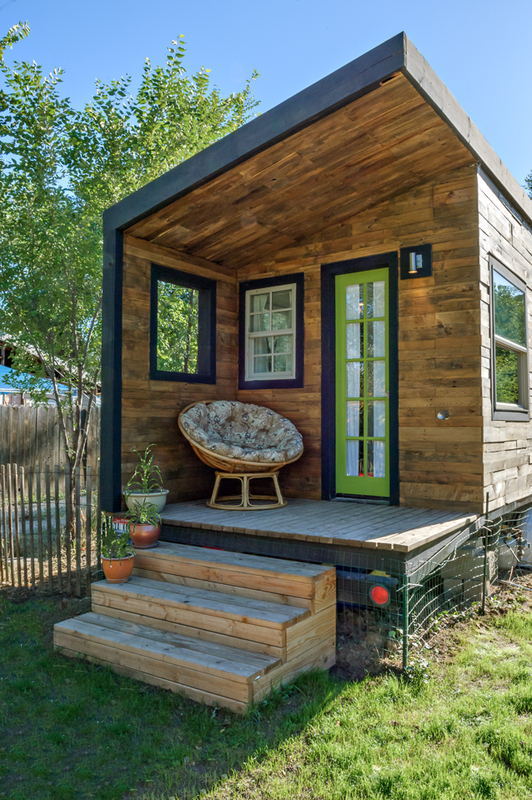 I would definitely suggest trying to get inside and get a feel for a tiny house in person and it will give you a better idea on that note at what will work. 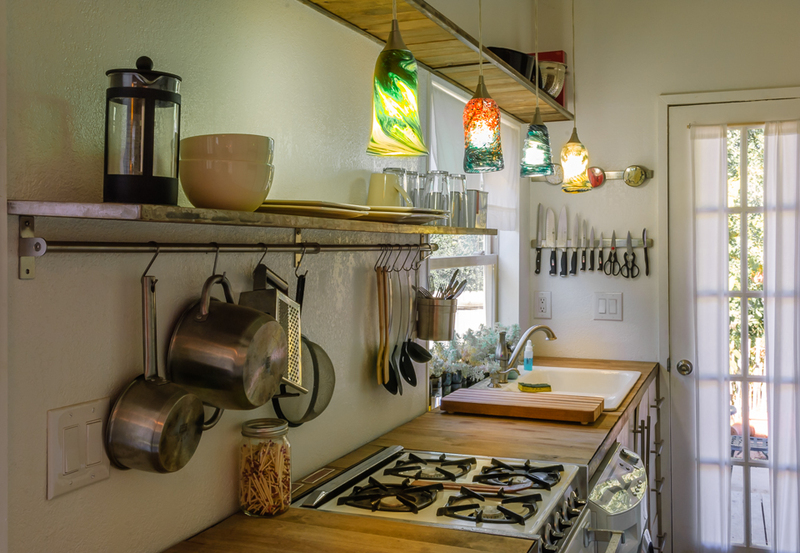 You might be able to find some local to you tiny houses via http://www.tinyhousemap.com, most people on there are very open to sharing their lifestyle. 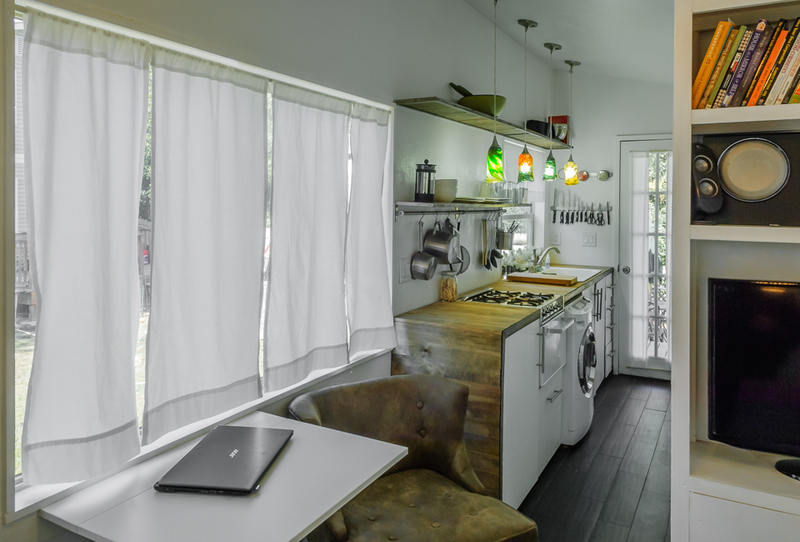 Just keep in mind that design plays a big hand in how a space feels and it’s easy to make a tiny house feel small, each person has a different idea of what is best! hope that helps! That is a total shame!! :/ My cost was just over 11k, I saved on labor and reclaimed materials (which are only a savings if you reclaim yourself). I have heard folks quoted around 50-55k if they take my design to a builder. If I had to buy all the materials new I’d estimate 22-25k so to add labor to that and 50kish seems ‘reasonable’ to have a turnkey version constructed. Hopefully that helps. Sono entrata in questo sito per caso, la sua piccola casa è davvero molto bella, ma è bello soprattutto il messaggio che lei vuole dare. Felice di essere venuta a conoscenza di questa vostra nuova realtà, soluto lei e la sua bella famiglia nella sua deliziosa casa. 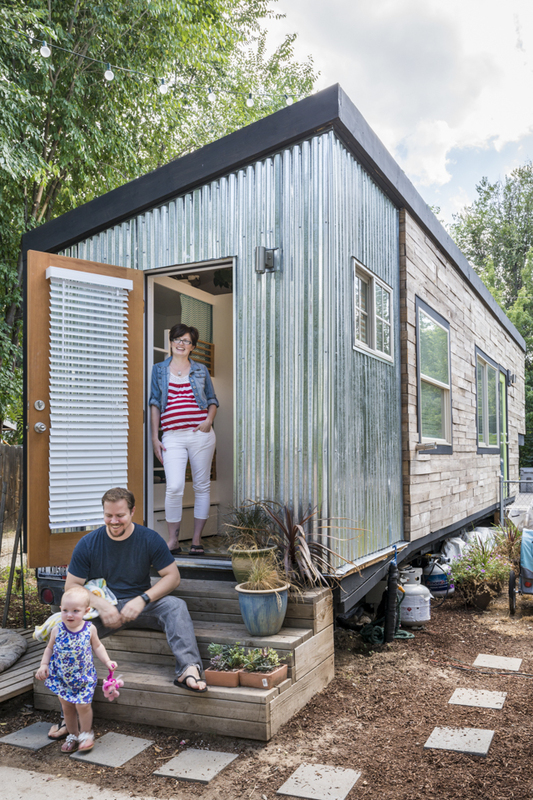 What rent- or payment-free land did you find on which to site your wonderful tiny home? Trying to figure out how I can do this.. I most definitely couldn’t either! 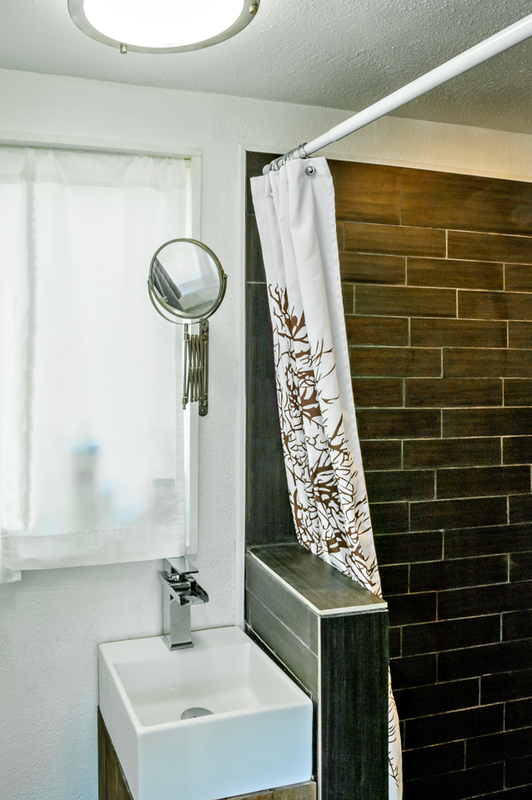 You have all the same options you have in standard housing and more. In part three of the ecourses (http://minimotives.com/courses/) I go over all the ways you van hook up to utilities, you definitely don’t have to make compromises in that department! Hi Kitka! It didn’t actually exist for about a year then I had my daughter so I made it for her safety while in the loft area. It is removable to get stuff in and out of there though! I looooooove this house! I really wish I could build this in my backyard for my parents so they could live rent free. to the details. keep on inspiring us. 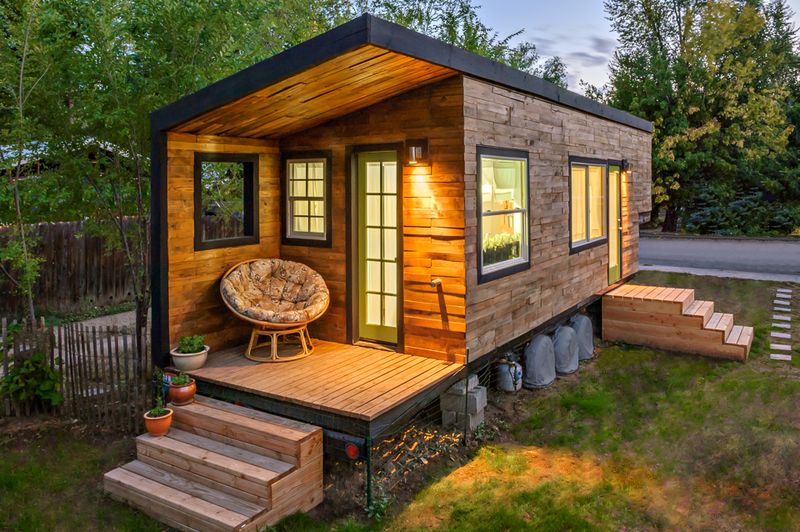 more and more tiny homes are needed in my opinion. I want to live in a commune of them with like thinkers. thanks and continued good luck in all your endeavors. thank you so much for your kind words Marilyn! This is awesome. I love it. I have been looking at designs to build me one. I love how you designed yours. Love you design!! Did you re-build or add-on and remodel the second version? Are plans available?? I am 66 and would love to have a tiny home near my dtr or in the back yard so Istill have my space… Also, I live in NW Pa and it gets cold. Did I miss a heater? I love your home it is beautiful, you’ve done an amazing job! 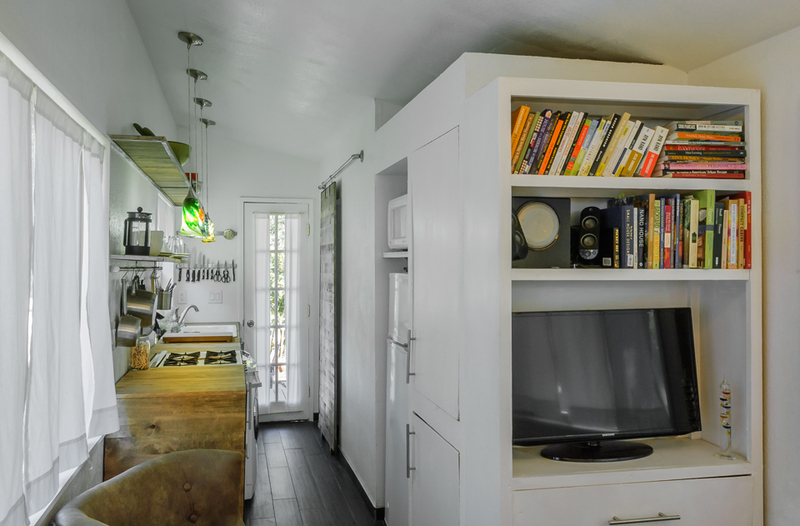 It’s exactly what I’m hoping for in my future tiny house. I read that you designed it yourself, do you have anywhere I could purchase the plan from for building my own? Thank you! Oh never mind I just looked through the other comments and found the link to plans! Oh good! Let me know if you need anything else! 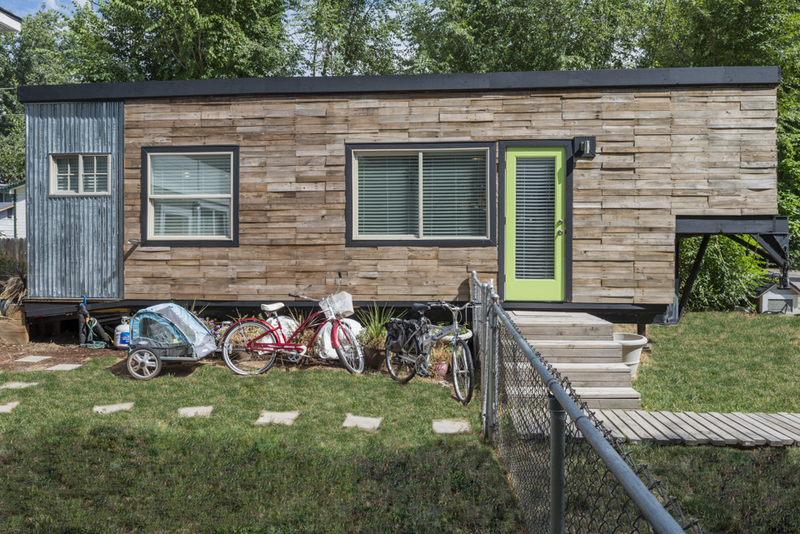 really cool to see a tiny house designed with young children in mind. 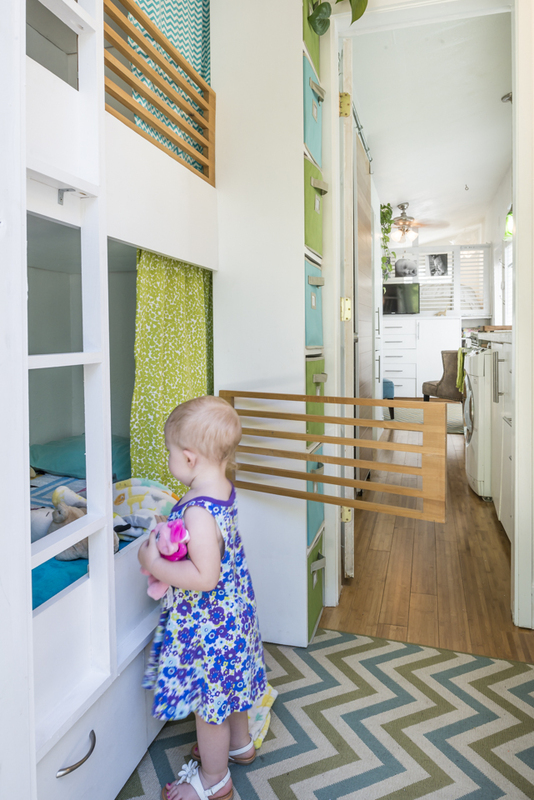 i have a little girl under 1 and trying to figure out a safe sleeping place for her as she grows was my biggest challenge while planning my tiny house. It has really worked well so far and I foresee it changing however it needs to, with us, for quite a while! Let me know if you need anything on your journey! 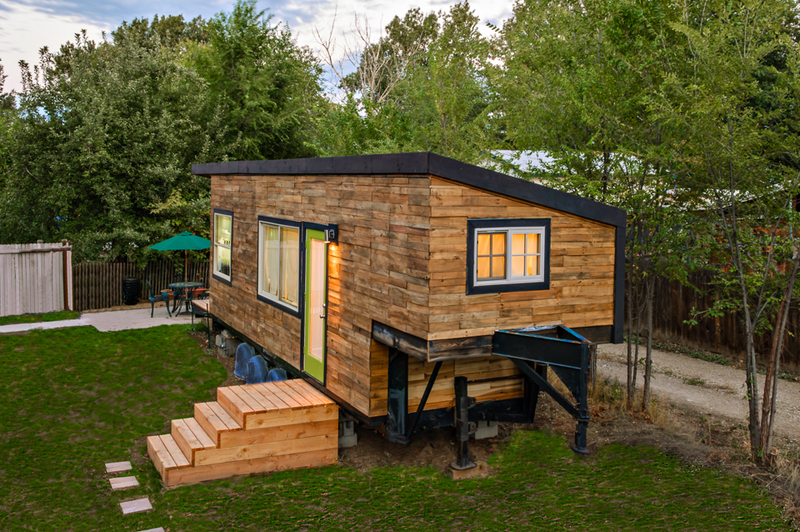 Do you own the land your tiny home sits on? Sorry if this has been asked and answered already. Its beautiful. Me and my husband want to do the same. I have a 5 year old. We just bought a land lot in St Agustine, Fl. This is something we want to do asap. We have been homeless for almost 2 month. We stay in a hotel but on Saturday we have to stay in our car so we can save some money. I am so exited about this. Wow. Beautiful. My favorite that I have seen so far!! Great job!! I love your original design but do appreciate you adapted it for your family. Im hoping if I decide one day to have kids and have a tiny house I can still keep it. What type of insulation did you use for the build? Hi Leanne, Thank you for the kind words. I used rigid insulation because it was accessible to me. It’s been a good choice! Where are clothes, shoes, coats and toys kept? 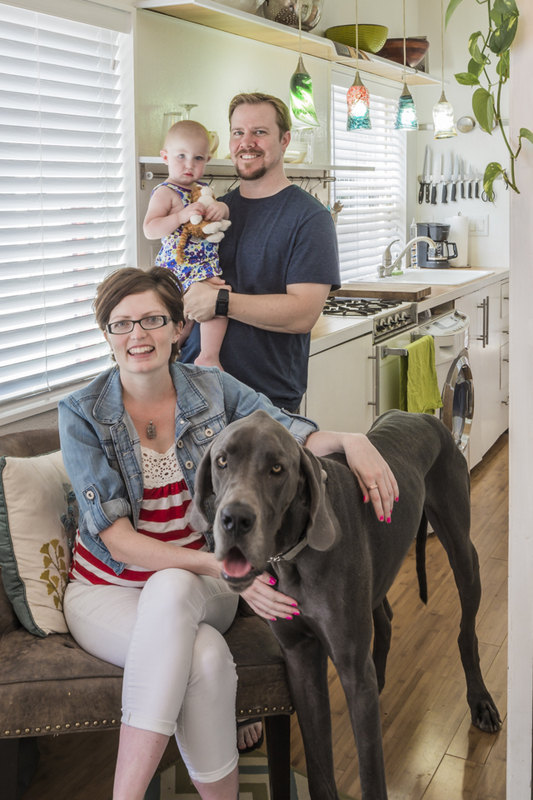 Hi, thanks for letting all of us strangers take a peak at your home! Can I ask what kind of composting toilet you use? Hi Macy! 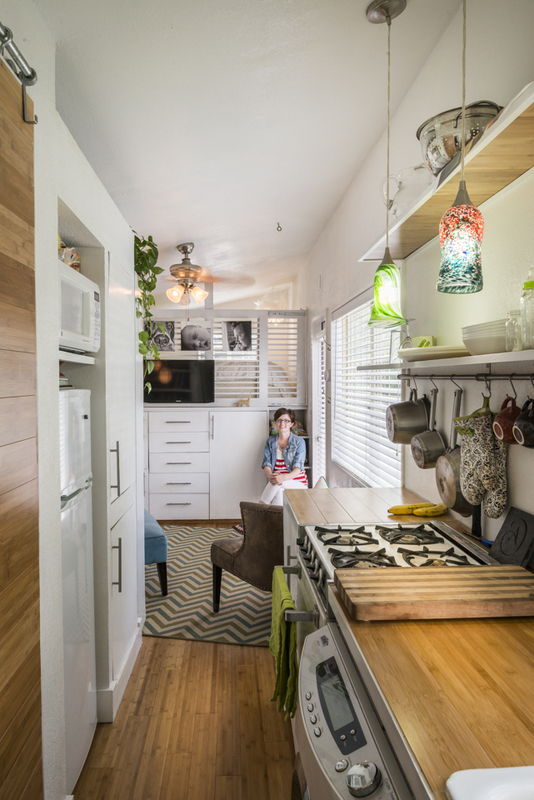 Love your tiny home! It’s fabulous! I have a few questions (I have not read anything on your blog other than this post, so maybe these have been answered somewhere). Would it be possible to get the building plans for your home? And I thought I read you built this under $11,000. Is that correct? There is a washer/dryer combo unit in the kitchen, next to the sink. Gotta love the Weimaraner, I have 3 in 230sf.